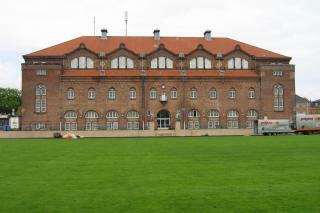 On 25 May 1911, Københavns Idrætspark in Fælledparken on Østerbro was opened. Spectators watched as a Danish team with players from the KB and B.93 clubs lost 2-3 to Sheffield Wednesday from England. In 1992, the totally renovated stadium was renamed Parken, which was easier to say. It was good that the project was over, as the area had been Denmark's biggest building site - second only to the Great Belt Bridge. Today, Parken is Denmark's largest stadium, with room for 41,641 spectators in stands surrounding a pitch measuring 105 m x 68 m. Parken is mainly the setting for home matches for F.C. Copenhagen and for the Danish national team. Football matches against Sweden have always stirred up emotions among the Danes. These matches helped make sport popular, especially between the wars. From the mid-1930s, the general non-sporting public huddled in front of the radio listening to the main attraction – a sports commentator called Gunnar Now" Hansen's infectious and enthusiastic, if not overly expert, reporting. The Swedish neighbours became arch enemies. The clash of Denmark vs. Sweden brought the Danes together in opposition to "the blue and yellows". The great football hero was centre forward Pauli Jørgensen, who played for Denmark from 1925 until 1939. The atmosphere surrounding the matches against Sweden changed during the Occupation and later in the excitement after Liberation. They became friendly matches rather than battles between arch enemies. "